May Day began in the United States, and immigrants played a decisive role in creating it. On May 1, 2006, more than 750,000 workers – most of them immigrants – took part in a demonstration for immigrant rights in Chicago. They marched past Haymarket Square, the very spot where immigrant workers had rallied in 1886. Many of the workers in the 2006 demonstration lived in Pilsen, a Chicago neighborhood named after a city in Central Europe where many of yesterday’s immigrants came from. The immigrant workers of Chicago had revived the celebration of May Day in the city where it had been created — by an earlier generation of immigrant workers. On May 1, 1886, workers throughout the United States struck to demand the eight-hour day. Chicago was the strike’s center. At that time, Chicago was the fastest growing city in the world. Its factories were being filled by workers from England, Germany, Ireland, Poland, Bohemia, Sweden and many other countries. Three days later, a rally was held at Haymarket Square in Chicago to protest a police attack on a group of strikers. Speeches were given in several languages. As this protest was winding to a close, cops moved in. They ordered the last speaker – an English immigrant, Samuel Fielden – to stop. Then someone threw a bomb. It killed one police officer and wounded many. The police opened fire, killing many participants in the rally. The police responded by breaking into homes, wrecking the printing presses of foreign-language newspapers, and beating and arresting union leaders. Immigrant workers were accused of being terrorists. Eight union leaders were put on trial, charged with being accessories to murder at Haymarket Square. One – Samuel Fielden – was from Lancashire, England. Six had been raised in Germany: George Engel, Adolph Fischer, Louis Lingg, Oscar Neebe, Michael Schwab, and August Spies. Despite worldwide protests, four of the defendants were hanged. (A fifth, Louis Lingg, died in his cell under suspicious circumstances.) Three were given long sentences. In 1889, at the International Labor Congress in Paris, a delegate from the American Federation of Labor proposed that the Congress adopt May 1 as International Labor Day. This article was originally published in the May 2013 issue of the Tribuno del Pueblo newspaper. For more information, go to www.tribunodelpueblo.org. Smiley’s People? Or LeCarré’s People? “I have a theory which I suspect is rather immoral,” George Smiley said in John le Carré’s 1974 classic, “Tinker, Tailor, Soldier, Spy.” “Each of us has only a quantum of compassion. That if we lavish our concern on every stray cat, we never get to the center of things.” This concept of necessary, if lamentable, sacrifice in the face of the Soviet monolith helped define the espionage masterpieces of the cold war. Such statements gave fans a rush of pleasure, partly aesthetic, partly clandestine — the feeling they were gaining a bit of secret Machiavellian wisdom. Times changed. The Soviet empire morphed from our sworn enemy into a sordid kleptocracy with whom business could be done, and le Carré turned his attention more fully to the West, which has always been his real subject. The enemies (big pharma, bent banks, blackhearted multinationals and the weak-willed politicians they buy) became less exotic. The old sacrifices — of lives, and of our own ethics — became less necessary. Many critics grew irritated. What happened to the particular pleasure of John le Carré’s moral relativism? “A Delicate Truth,” like most of le Carré’s recent novels, feels like a rebuttal to George Smiley’s theory. How many stray cats can we allow to be snuffed in order to reach our ends? Or, as le Carré put it in an essay in last month’s issue of Harper’s, “How far can we go in the rightful defense of our Western values without abandoning them along the way?” Back in 1963, in “The Spy Who Came In From the Cold,” we watched that novel’s stray cat, Liz Gold, die on the Berlin Wall. A shame, yes, but in the grand scheme of things an acceptable loss. Fifty years later, “A Delicate Truth” suggests that even little Liz Gold would be too much of a sacrifice. We open in 2008, when a servant of the Crown known to us only by his cover name, Paul Anderson, is going a bit mad waiting in a hotel room in Gibraltar. He’s been sent to be the eyes and ears of Fergus Quinn, M.P., during Operation Wildlife, which aims to exfiltrate a terrorist visiting the British Crown Colony. Wildlife is a joint endeavor between Quinn and a private American security firm called Ethical Outcomes, which “will be providing the full American-style coverage.” Once he’s finally in the field, Paul realizes that “war’s gone corporate.” Although he sees little of the action, he’s told the maneuver went off without a hitch — a great secret success, for which Paul will later, under his real name, Christopher (Kit) Probyn, be awarded a commissionership in the Caribbean and a knighthood. Toby may be depressed, but he hasn’t quite lost his idealism. Once he realizes his minister is hiding something important from him, he begins to dig until he uncovers some of the machinations and personal interplay that are leading inexorably to Operation Wildlife. He even meets the leaders of Ethical Outcomes, a dodgy British operative named Jay Crispin and Mrs. Spencer Hardy of Houston, Tex., “better known to the world’s elite as the one and only Miss Maisie.” Toby recognizes what Paul/Kit does not: namely that a government minister is embarking on a private military op with the help of mercenaries. Alarmed, Toby shares the news with a trusted ear, but he is working in a sphere in which no good act goes unpunished, and so it goes for him. These events form the prologue for the action that takes place three years later when a member of the British Special Forces assigned to Wildlife unexpectedly confronts Sir Christopher Probyn — Kit — in the midst of his idyllic retirement in North Cornwall. He’s come to share the darker facts of Wildlife, the operation Kit still holds on to with secret pride, his great act of derring-do for the nation. The narrative dominoes fall with masterly precision once Toby Bell returns, and by the time he’s joined by Kit’s alluring daughter the story settles into classic conspiracy thriller territory, the two of them racing to assemble evidence before they can be silenced by the men who pull the strings. As ever, le Carré’s prose is fluid, carrying the reader toward an inevitable yet nail-biting climax. This is John le Carré’s 23rd novel, and neither prolificacy nor age (he’s 81) has diminished his legendary and sometimes startling gift for mimicry. More than the inventory of closely observed outfits, chronicles of public schools and slumped, bookish frames, it’s the voices that give the characters in “A Delicate Truth” their most immediate claim to three-­dimensionality. With, however, one exception: Miss Maisie, Ethical Outcomes’ down-home right-wing zillionaire, with a mouthful of accent and affectation to match. Her appearance among the sophisticates of the Foreign Ministry is like a slap in the face, and while she’s ushered offstage quickly, you’d be forgiven for seeing in her caricature evidence of the accusation leveled at le Carré regularly these days: anti-Americanism. Having lived in Europe for the last decade, I’m particular about how to use that label. To me, “anti-American” means just that: to be contemptuous of Americans, one and all. I’ve met those people. Blinded by their ignorance, they’re to be scorned. But then there is John le Carré, whose January 2003 argument against the Iraq war, printed in The Times of London, was called “The United States of America Has Gone Mad.” He made his ire plain: he was against the foreign policy of an American administration he despised. If this is what qualifies him, then half of our own population is anti-American. The enemy in le Carré’s universe, both fictional and not, isn’t America. It’s the virus of shortsightedness, hypocrisy, lies and unfettered greed that plagues the “post-imperial, post-cold-war world” Toby Bell so wants to help shape. And while the few Americans in “A Delicate Truth” are not to be loved, their British counterparts are even more despicable, particularly the New Labour politicians who have clearly disappointed le Carré the most deeply, having marched willingly with America into Iraq. Describing a posting to Cairo early in Toby’s diplomatic career, le Carré writes: “At weekends, he enjoys jolly camel rides with debonair military officers and secret policemen and lavish parties with the superrich in their guarded desert condominiums. And at dawn, after flirting with their glamorous daughters, drives home with car windows closed to keep out the stench of burning plastic and rotting food as the ragged ghosts of children and their shrouded mothers forage for scraps in filthy acres of unsorted rubbish at the city’s edge.” Here is le Carré with the gloves off, turning his back entirely on George Smiley’s old stray cat theory and aiming his dagger at those who would twist Smiley’s words for their own purposes. Is this what we’ve done with our cold war victory? The spymaster-as-hero is gone, replaced by the whistle-blower, the outsider who retains enough of his heart to be appalled by the slaughter of strays. In Cairo they’re the young trash collectors living on the city’s edge, but in Gibraltar they’re even more insignificant: one mother and her child, around whom the whole novel rotates, and for whom le Carré’s rage simmers. By the end of “A Delicate Truth,” you either share his anger at the injustices between its covers, or you don’t. 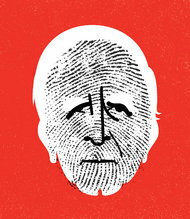 If you do, then you’re one of le Carré’s people. If not, you’re one of Smiley’s. It’s up to you to decide which one is more worthy. Olen Steinhauer is the author of eight novels, most recently “An American Spy.” He lives in Budapest.